The first industrial buildings were built into Pyöräsuo area in 1869 when Tschusoff & Sapetoff built the Bavaria beer, vinegar, punch and asphalt factories. Tragman & Bandholz had built a mechanical engineering workshop in the area and Tschusoff & Sapetoff bought it in 1884. On the verge of bankruptcy in 1893 the company sold the factories to Commercial Counsellor K. Sergejeff, who only continued to run the beer factory. Sergejeff’s beer factory was the fourth largest Finnish brewery in 1939 when Sergejeff advertised that a part of the profit on the Olympic drink goes to the Olympic fund of Finland. A pump house had been built in the area in 1892. It provided the town with water until 1908 when a new water pumping plant was built in Liimatta. The street plan of the industrial area was approved by the town council in 1911. 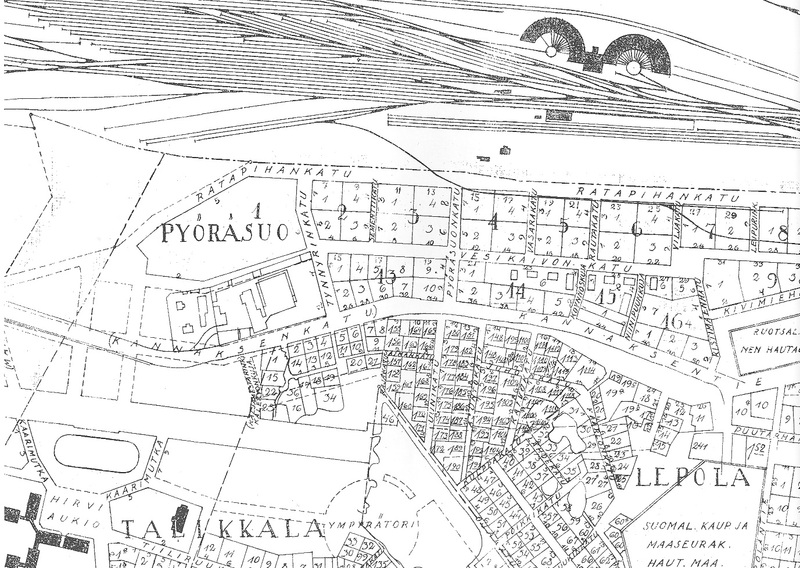 It covered the area between Pietarintie road (Kannastie from 1929) and the railway, all the way to Ristimäki cemetery. In 1934, a workshop was built for Vyborg road and water engineering district at the corner of Vesikaivonkatu street and Viljakatu street. The building included an engine room, repair shop, forge, and paint shop as well as room for three cars, 12 lorries, and 16 road graders. The workshop was equipped with the latest technology. The newest building of the area was the cemetery chapel, which was finished at the end of September 1939 in the western part of Pyöräsuo. The chapel was partly underground and first of its kind in Finland. In addition to the above-mentioned, Ristimäen Halko ja lautatarha, Viipurin Autokori Oy, Viipurin Laatikkotehdas Oy, Viipurin Rakennus- ja huonekalutehdas, Karhusuon Sementtivalimo Oy, Kivilouhimo- ja hiomo, Ristimäen Kutomo, Maamiestenmyllyn mylly, Viipurin Valssimylly Oy, and Viipurin Laatikkotehdas Oy were located in Pyöräsuo.